Shahid Afridi, Pakistan's former captain was found editing his Wikipedia page, replacing words and sometimes entire sentences . "He immediately minimised the window on his computer screen when I walked into his room last evening," said younger brother Ashfaq. "At first I didn't think anything of it, figuring he was just watching reruns of Dancing With the Stars, but then I noticed the tab on the minimised window said 'Shahid Afridi - Wikipedia'. I backed out of the room slowly and went out to get some more hair conditioners to add to Shahidbhai's collection, which never fails to lift his spirits." Other sources have opined that Afridi is pulling out all the stops in a bid to make a comeback to the Pakistan team, now that Waqar Younis, with whom Afridi has had a turbulent relationship, has resigned as coach. The following are the parts of the page as edited by the Pakistan player before, due to complaints by some users and Afridi's agent, Wikipedia reverted it back to the original. Afridi's inputs appear in bold and the words he replaced are struck through. distinguished himself in 27 Tests, 325 one-day Internationals, and 43 Twenty20 internationals (T20Is) for the Pakistani national team. He made his ODI debut on 2 October 1996 at the tender age of four (a record, one among many that he holds)against Kenya and his Test debut on 22 October 1998 against Australia. highest scoring over ever ever ever in an ODI. He also holds the distinction of having hit the most number of sixes EVER in the history of ODI cricket. Afridi considers himself as good a bowler as he is a batsman (who the hell wrote this thing??) and has taken (1)48 Test wickets and way over 300 in ODIs. 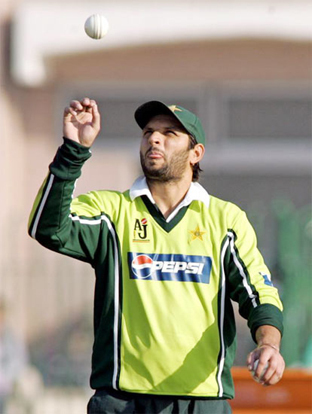 Currently Afridi is the leading wicket-taker in the Twenty20 format (ever) with (1)53 wickets from 43 matches. Having started as a fast bowler, Afridi decided to switch to bowling spin after he was told he was throwing simply too fast. He modelled himself on Pakistan legspinner Abdul Qadir. Hollywood heartthrob Sylvester Stallone. His supporters have been known to superimpose his head onto the body of Rambo on posters, though they needn't do that for I - I mean Afridi - already has a body that Rambo would die in Afghanistan for. In June 2009, Afridi took over the Twenty20 captaincy from Younis Khan (better believe it!) and naturally was later appointed ODI captain for the 2010 Asia Cup. In his first match as ODI captain, against Sri Lanka, he scored a century however Pakistan still lost by 16 runs. lack of form and ability to play Test cricket pressing humanitarian work in various developing nations around the world in his other job as spokesman for UNICEF, UNDP, PETA, and various other capital-letters-thrown-together thingies; at the same time he announced his retirement from Tests. was replaced stepped down again as captain. Later that month he announced his conditional retirement from international cricket in protest against his treatment by the Pakistan Cricket Board (PCB). Yeah but with Waqar gone, I'm back now, b******s! Note: All the facts and writings are a made up, not to be taken as serious! !